The world needs heroes - join the HERO PROJECT today! Welcome to the HERO PROJECT, rookie - we need your help! My name is Captain Midnite, I’m a member of Parliament - the PARLIAMENT of HEROES, twelve strong, standing together against the inevitable tide of mankind’s dark destiny. 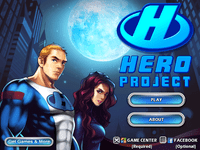 We created the HERO PROJECT so you can help us save the world. This is a world in crisis, a crisis foreseen by few, and understood by none - until now. We must take ACTION! No more cities in flames or destroyed by angry mobs! No more evil-doers taking our valuable, precious stuff! No more kittens inexplicably stranded in trees! It’s time to make a STAND - join the HERO PROJECT and stamp out super-villainy FOR GOOD! The time is NOW. Let your inner Hero loose and we WILL save the world, second-by-second, street-by-street, kitten-by-kitten.